A few buried Pikpik carrots in the Piklopedia. Pikpik carrots (ピクピクニンジン?) are vegetables native to Captain Olimar's home planet, Hocotate. In Pikmin, it is stated that Olimar's favorite soup contains "three large onions and hundreds of miniature red, yellow, and blue carrots". The reason Pikmin have their name is because Olimar believes that Pikmin resemble them, and they live in craft that resemble onions, which also reminds him of his favorite soup. In Pikmin 2, pikpik carrots are seen in the in-game Piklopedia and look just like normal carrots – orange, about the size of a Pikmin, and having long leafy parts. These can be thrown at the Piklopedia's enemies and plants to see their reactions, such as the creature moving or waking up, or eating and attacking the carrots. The creatures will usually treat the carrots like Pikmin. In Pikmin 3, pikpik carrots are mentioned by Brittany while on the S.S. Drake. She states Hocotate is famous for the pikpik carrots cultivated there, and that personally, she dislikes the taste. In Hey! Pikmin, the S.S. Dolphin II mentions that the Pikmin are similar to pikpik carrots. In the log for Red Pikmin, Olimar mentions that he loves eating pikpik carrots. In the log for Squirting Squirt, Olimar talks about the time when his son got a box of his favorite pikpik carrot cookies wet by playing with his water gun. A golden carrot in the secret cutscene Louie's Dark Secret. Golden pikpik carrots are completely golden, even the leafy stem. They are a bit longer than the orange variety, and have three curled roots, instead of the basic cone-shaped root. These are thought to be very valuable, and at the beginning of Pikmin 2, Louie is instructed to deliver a cargo of them. However, Louie encountered a "ravenous space bunny" which supposedly ate the whole shipment. Pikmin 2 screenshot of the pikpik carrots acting as Pikmin. Inside the files of Pikmin 2 and Pikmin 3, there is data for an entirely new species of Pikmin, which are essentially the pikpik carrots. By editing the files, it is possible to force the games to spawn pikpik carrots as usable Pikmin. This is best done in Pikmin 2 by editing the Challenge Mode level files, which have data for the starting number of Pikmin of each type, including a 7th type – the carrots. 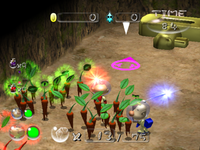 Internally, the game recognizes the carrots as being a type of Pikmin – this is necessary in order for the Piklopedia's carrot feature to work properly. The inclusion of a configuration file setting to enable pikpik carrots as party members is however quite mysterious. They look the same as the carrots seen anywhere else in the series: they look like a carrot, naturally, with a stem with a leaf on top, and with two root endings on the bottom. In-game, they float slightly above ground, and are animated in a fashion similar to that of regular Pikmin, except their model only moves and stretches; they don't bend. In Pikmin 2, their stems always include a leaf, regardless of their maturity or the effects of an ultra-spicy spray, but can have a bud or flower in the same place as the leaf. When idle, their stems glow green, much like Bulbmin, and all of their sound effects match those of regular Pikmin, besides Bulbmin. They do not release a spirit. In Pikmin 3, when idle, their stems glow peach, and their spirits are white. When they carry something, the fraction numbers are cream-colored. In Pikmin 2, they can be grabbed, thrown, buried, plucked, and overall, act like all other Pikmin types. However, they bear no resistance to any hazard, nor do they have any other special attribute. In Pikmin 3, however, they are more limited: they act like normal, but cannot be grabbed or thrown. If they try to attack something, the game freezes. If they deliver an item to an Onion, it does its spitting animation, but no seeds come out. In both games, the code that shows the standby Pikmin type on the HUD ignores these type of Pikmin, so they lack an icon. Although they have no real Pikmin behavior in the Piklopedia, they will still turn around to face the creature, after being thrown. Their front is the opposite side from where the stem droops. When entering the final sublevel, if the active leader bumps against carrot Pikmin while the "FINAL FLOOR!" text is on-screen, the HUD will present a bud Blue Pikmin on the standby icon. This page was last edited on January 8, 2019, at 23:16.